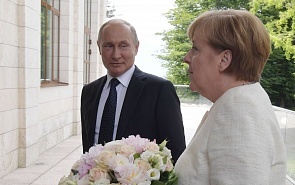 On Saturday, August 18, Angela Merkel will meet with Russian President Vladimir Putin at the Schloss Meseberg government residence. Although the summit has no official agenda, Syria seems to be its most important topic. The two countries’ leaders will continue to discuss the issues raised at the meeting between Angela Merkel (who interrupted her vacation) and Russian Foreign Minister Sergey Lavrov and Chief of Staff Valery Gerasimov in the presence of German Foreign Minister Heiko Maas. It is worth noting that Gerasimov is on the sanctions list, and Merkel never answered the request from the opposition on why he had flown to Berlin beyond the format of official international events. As for Syria, Merkel is interested in Germany’s interaction with Russia and France. Such interaction is especially important in the humanitarian sphere and in terms of reconstruction of the civil infrastructure, which can motivate the Syrian refugees residing in the European Union (they constitute an absolute majority in Germany and the EU) to return to their homeland. The plan of interaction with Ankara in this sphere, which she proposed in March 2016 and for which the EU allocated 6 billion euros, has worked only partially. Infrastructure, hospitals and other facilities are being built for more than three and a half million refugees in Turkey, but there was no real exchange of refugees: over two years 2,100 people arrived from Greece’s Aegean islands while around 12,500 people were sent to the EU. If the motivational mechanism of bringing back Syrian citizens works, this will be a clear win for Merkel. Putin will also win, if he manages to draw Germany along with France to humanitarian cooperation and the restoration of infrastructure in Syria. At the same time, the stumbling block in relations between Russia and the European Union is the fate of the current Syrian government, qualified by the collective West as the “unacceptable” Assad regime. Perhaps Putin will try to involve Merkel in a deeper discussion of joint steps to resolve the situation in the Middle East – and Germany, in principle, wants it. The second significant set of issues is Ukraine. The Minsk Agreement and the Normandy format are in a dead end. Recently Russian Foreign minister Sergey Lavrov said that the present agenda lacks any issues that could improve the implementation of Minsk. It is clear that this is hampered by Kiev, which considers sanctions the only efficient means of pressuring Russia. Neither Merkel, nor Macron, nor Putin like it. Let us hope that some real proposals will be made – as it was last year in September, when Putin proposed to introduce the OSCE protection via the UN military mission. In my opinion, this happened precisely after discussing this issue with Merkel in Sochi on May 2, 2017. The third set of issues on the agenda are the European-Russian and German-Russian economic cooperation. Considering the risks and threats from the United States’ extraterritorial sanctions, the main priority here is the energy sphere. In the context of cooperation with Russia, these sanctions could affect the largest European energy actors, including the German ones. The most vulnerable project in terms of the impact of sanctions is Nord Stream 2. President Trump and Congress have repeatedly said that if the project continues, they will do everything to close it, so Merkel and Putin are likely to discuss possible joint actions in case of harsh and targeted sanctions introduced against Nord Stream 2. Taking Iran as an example, we could see that the major players operating on the US territory prefer to avoid the risk zone: possible penalties are higher than any profits obtainable in Iran and, for that matter, in Russia. The updated 1996 EU Blocking Statute, reintroduced on August 7, does not really protect major players that do business in the US – just like the Russian law on countering American sanctions. In addition, there may be announcement that the parties are ready to discuss transition to payments in euros between Russia and the EU for all groups of goods, specifically for fossil fuel. The parties are likely to confirm their willingness to continue to engage with Iran under the JCPOA. It is worth noting that meetings like this point to a good level of engagement between the two parties. Surely, this is not about rapprochement, but it shows pragmatic approach in the two countries’ relations, which has been developing over the past three years, especially after the abovementioned Putin-Merkel meeting that took place on May 2, 2017. The negotiations lasted for almost three hours, and neither Putin nor Merkel disclosed the agreements reached. But a very neutral attitude of Russia to the electoral campaign in Germany and all the parties that were elected to Bundestag seems to be quite remarkable. Besides, improvement of relations with Russia is the task of the Grand coalition government. The coalition agreement has an article saying that Germany stands for early resumption of dialogue at the NATO-Russia Council level. In case of progress in terms of adherence to the Minsk agreements, the government promises to bend every effort in order to persuade its partners to soften the sanctions regime. Therefore, there is some hope that things get off the ground in Meseberg, though pessimism about it seems to prevail over optimism.